I have to mark a certain item in a way that will make it stick-out in the background. I need it to be surrounded with the color that contrasts the background as much as possible so it will pop out and easily noticeable by the player. Lets say I know the background is color 'x', how do I find 'y' such that it will be very contrasting to 'x' and easy to notice in a background where 'x' is a dominant color? I first thought about inverting color 'x' and then I noticed that when 'x' is a medium shade of gray, if I invert 'x' to get 'y', then 'y' is also a medium shade of gray which does not work. A quick and easy way - though not 100% precise one - is to consider just the five extreme points white, black, red, green and blue. Or, if you just want a quick approximation, use Clinear = Csrgb2.2. The second one is the calculation from the HSV colour space. If the saturation is low enough (pick any value you like; something between 0.3 and 0.5 would work fine), check the luminance; if that's > 0.5, your contrasting colour is black, else if it's < 0.5 the colour is white. For exactly Y = 0.5, both work. If your hue is between 60° and 180°, your colour is green, if it's between 180° and 300°, it's blue, else it's red. Extend it to yellow, turquoise and magenta for more variation, or just use the opposite of the just-calculated hue at maximum saturation and lightness. This assumes that R, G and B are floating-point numbers ranging from 0.0 to 1.0. If what you have is, say, integers from 0 to 255, convert them to floats and divide them by 255. This approximate formula is still within &pm;0.05 of the correct luminance calculated with the official piecewise formula given by Martin (or with the gamma = 2.2 approximation used above, which itself is within &pm;0.01 of the official formula), and so more than close enough for this purpose. Besides, you can mostly compensate for the error simply by adjusting the threshold slightly. Finally, note that, if the background has a very busy texture, it's possible that no single color may stand out from it very effectively. In such cases, you may want to consider using combinations of colors, such as black text with a white outline. Ps. Earlier versions of this answer suggested using the uncorrected threshold L > 0.5. However, this suggestion ignores the fact that the gamma correction used in the RGB color space approximates the perceptual non-linearity of the human eye, so that the shade of gray that looks about halfway between black and white is indeed close to RGB(0.5, 0.5, 0.5). Thus, to get an accurate measure of perceptual luminance, we really need to apply a final inverse gamma correction to the linear luminance L — or, equivalently, just apply gamma to the thresholds as well. This formula does tend to overestimate the brightness of highly saturated colors; for example, for pure green it gives luma = 0.7152, whereas properly applying gamma correction would give pow(L, gamma) ≈ 0.478. Fortunately, for saturated colors, either black or white will provide a decent contrast anyway. Since there is some subjectivity to any answer here, I'll offer one that is easy to understand and easy to compute. Whether it suits you and your needs is up to you. 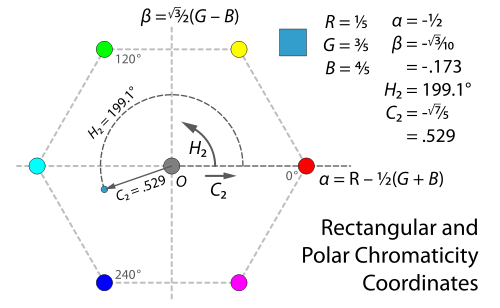 Imagine color space represented by R, G, and B values each on the interval [0,1]. Imagine the RGB value being a vector in color space, where that vector is confined to a cube. For any RGB value in that space, the most contrasting value would be geometrically as far away from that value while still being on that cube. Offset the cube, so it is centered at the origin, with new values r, g, and b on the interval [-0.5, 0.5]. Do the by subtracting 0.5 from all of the original RGB values. Now compute the sign of each component of rgb and multiply by -0.5. This will put you at one of the vertices of the offset color space cube. Add 0.5 to each value to restore the values to the original color space cube. Which means that something grey like (128,128,128) will turn into something very grey (127, 127, 127). You may want to try inverting the hue instead. Convert your color to HSV mode and invert the hue color.hue = 360-color.hue. You could additionally invert the saturation. Ultimately, it sounds like you're the one choosing the original colors here. So just choose colors that invert nicely. Not the answer you're looking for? Browse other questions tagged graphics-programming color ui-design or ask your own question. How do I change a sprite's color? What is the color value of daylight?